APRIL 20, 2016 -- Wednesday, April 20, marks six years since the blowout on the Deepwater Horizon oil rig in the Gulf of Mexico. That terrible incident was the start of a three month-long oil spill of millions of gallons per day until the well was capped on July 15, 2010. The cleanup took years to complete, the natural resource damage assessment was just finalized this spring, and restoration activities will take decades to complete. 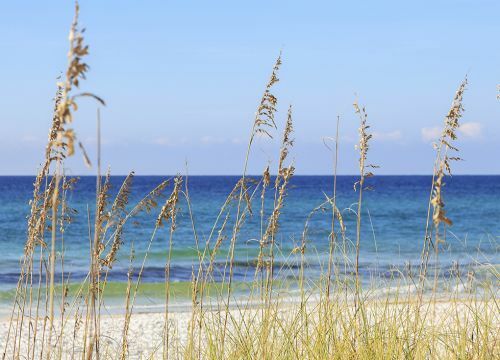 Many long-term research projects are underway, and we are still learning about the effects of the spill on the environmental and the coastal communities of the Gulf of Mexico. On April 4, 2016, the court approved a settlement with BP for natural resource injuries stemming from the Deepwater Horizon oil spill. This settlement concludes the largest natural resource damage assessment ever undertaken. It is safe to say that scientists will be publishing papers and results for decades. For many of the people involved, the Deepwater Horizon oil spill is considered THE SPILL, the same way the generation of scientists that worked on the Exxon Valdez spill in Alaska almost 30 years ago consider that event. We even keep track of events in a rough vernacular based on those incidents: Post-Deepwater or Pre-OPA (the Oil Pollution Act, passed in 1990, the summer after the Exxon Valdez spill). But while those spills generate most of the publicity, policy interest, and research, responders in NOAA, the U.S. Coast Guard, and other agencies know that spills are a routine occurrence. Since the Deepwater Horizon spill, NOAA's Office of Response and Restoration has responded to over 800 other incidents. Most are ones that you've probably never heard of, but here are a few of the larger incidents since Deepwater Horizon. Enbridge Pipeline Leak, Kalamazoo, Michigan: On July 25, 2010, while the nation was fixated on the spill in the Gulf of Mexico, an underground pipeline in Michigan also began gushing oil. More than 800,000 gallons of crude oil poured out of the leaking pipeline and flowed along 38 miles of the Kalamazoo River, one of the largest rivers in southern Michigan. The spill impacted over 1,560 acres of stream and river habitat as well as floodplain and upland areas, and reduced recreational and tribal uses of the river. A natural resource damage assessment was settled in 2015 that will result in multiple resource restoration projects along the Kalamazoo River. Exxon Mobil pipeline rupture, Yellowstone River, Montana: On July 1, 2011, an ExxonMobil pipeline near Billings, Montana, ruptured, releasing an estimated 31,500 to 42,000 gallons of oil into the iconic river, which was at flood-stage level at the time of the spill. Oil spread downstream affecting sensitive habitats. Paulsboro, New Jersey, rail accident and release: On November 30, 2012, a train transporting the chemical vinyl chloride derailed while crossing a bridge that collapsed over Mantua Creek, in Paulsboro, New Jersey, near Philadelphia. Four rail cars fell into the creek, breaching one tank and releasing approximately 23,000 gallons of vinyl chloride. A voluntary evacuation zone was established for the area, and nearby schools were ordered to immediately take shelter and seal off their buildings. Molasses spill, Honolulu, Hawaii: On September 8, 2013, a faulty pipeline operated by Matson Shipping Company leaked 233,000 gallons (1,400 tons) of molasses into Hawaii's Honolulu Harbor. A large fish kill resulted. Texas City "Y" collision, Galveston, Texas: On March 22, 2014, the 585 foot bulk carrier M/V Summer Wind collided with an oil tank barge, containing 924,000 gallons of fuel oil. The collision occurred at the intersection, or "Y," in Lower Galveston Bay, where three lanes of marine traffic converge: vessels from the Port of Texas City, the Houston Ship Channel, and the Gulf Intracoastal Waterway. The collision breached the hull of the tank barge, spilling about 168,000 gallons of fuel oil into the waterway. A natural resource damage assessment is underway, evaluating impacts to shoreline habitats, birds, bottlenose dolphins, and recreational uses. Refugio State Beach pipeline rupture, California: On May 19, 2015, a 24-inch crude pipeline ruptured near Refugio State Beach in Santa Barbara County, California. Of the approximately 100,000 gallons of crude oil released, some was captured and some flowed into the Pacific Ocean. The spill raised many challenges. 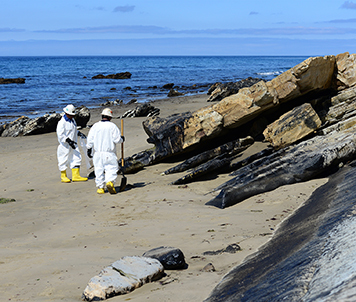 The spill occurred in an especially sensitive region of the coast, known for its incredible diversity of marine life and home to the Channel Islands National Marine Sanctuary. The Refugio spill site is also the site of one of the most historically significant spills in U.S. history. Just over 46 years ago, off the coast of Santa Barbara, a well blowout occurred, spilling as much as 4.2 million gallons of oil into the ocean. A natural resource damage assessment for the Refugio spill is underway, focusing on impacts to wildlife, habitat, and lost recreational uses. Barge Apex 3508 collision, Columbus, Kentucky: On September 2, 2015, two tug boats collided on the Mississippi River near Columbus, Kentucky, spilling an estimated 120,500 gallons of heavy oil. The oil sank to the river bottom and had to be recovered by dredge. Train derailment, West Virginia: On February 16, 2015, a CSX oil train derailed and caught fire in West Virginia near the confluence of Armstrong Creek and the Kanawha River. The train was hauling 3.1 million gallons of Bakken crude oil from North Dakota to a facility in Virginia. Of the 109 train cars, 27 of them derailed on the banks of the Kanawha River, but none of them entered the river. Much of the oil they were carrying was consumed in the fire, which affected 19 train cars, and an unknown amount of oil reached the icy creek and river. Each year NOAA's Office of Response and Restoration is asked to respond to an average of 150 incidents and so for this year we have been asked for help with 43 incidents. Most of these were not huge, and include ship groundings in Alaska, Oregon, Washington, and Hawaii; five sunken vessels, fires at two marinas, a burning vessel, and an oil platform fire; nine oil spills and a chemical spill; and multiple "mystery sheens"—slicks of oil or chemicals that are spotted on the surface of the water and don't have a clear origin. Since 1990, we have responded to thousands of incidents, helping to guide effective cleanups and protect sensitive resources. Also, since 1990 and with our co-trustees, we have settled almost 60 spills for more than $9.7 billion for restoration. We hope that we will never have to respond to another "Deepwater Horizon" or "Exxon Valdez," but should a large disaster occur, we will be ready. In the meantime, smaller accidents happen frequently and we are ready for those, too.